We’ve commented quite a few times recently on how the low volume of homes being transacted across the country is creating tough conditions across the real estate sector. 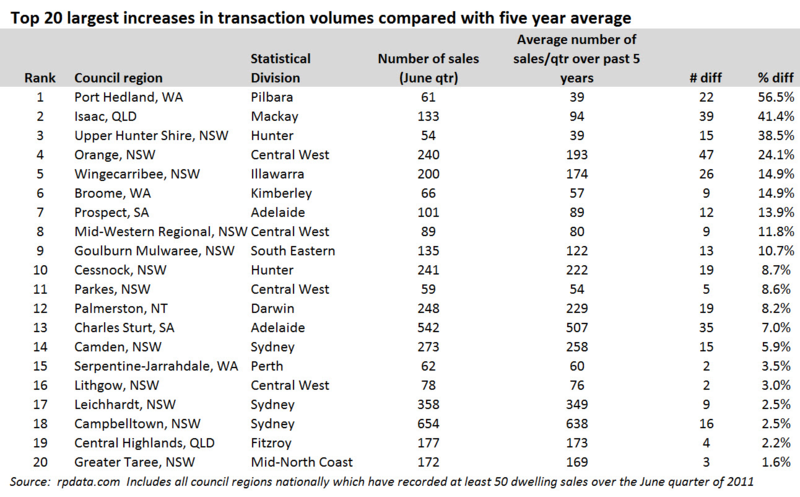 Transactions volumes nationally are running about 11% below the five year average. The good news is that national sales volumes have shown some subtle improvements over the three months to July and are likely to show further improvements from the low base as the year progresses. 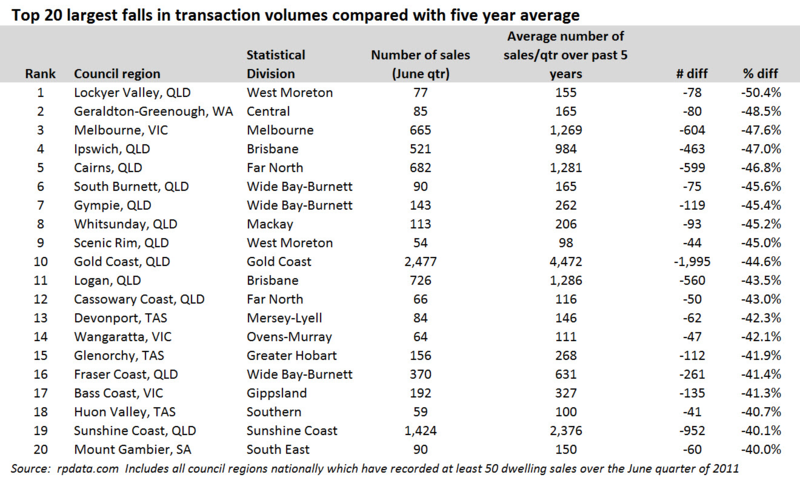 At a more granular level, an analysis of council regions (LGA) around the country shows that less than 10 percent of Australia’s LGA’s have recorded a higher number of sales over the June quarter this year compared with the five year average. The tables below summarise the top and bottom 20 regions based on June quarter sales volumes compared with the five year average benchmark. Volumes are tracking above average in many of the resource intensive locations while it is primarily a combination of lifestyle markets, outer fringe housing markets and the inner Melbourne unit market where sales volumes are running at levels significantly below what might be considered ‘normal’. The Pilbara’s Port Hedland, where the median house price is $775,000 and rental yields are averaging 13%, tops the list for percentage uplift based on June quarter sales compared with the five year benchmark. Second is the Bowen Basin coal mining region of Isaac,followed by the Upper Hunter region which is also synonymous with coal and natural gas extraction. The trends at the other end of the spectrum are more diverse. The transaction numbers for Queensland’s Lockyer Valley and Ipswich are still likely being affected by the severe flooding from earlier in the year. Melbourne’s inner city unit market is showing transactions to be down48% compared with the five year average which may be attributable to the combined effects of a slowdown in the local market as well as lower overseas student numbers. Lifestyle markets along the Queensland coast such asCairns, Whitsunday, Gold Coast, Cassowary Coast, Fraser Coast and Sunshine Coast are all prime examples of how the sea change has pretty much come to a standstill resulting in few transactions around these coastal regions. The results highlight how the multi-speed economy is influencing housing markets particularly from a resources and lifestyle market perspective. How long these trends persist is anyone’s guess,however clearly the resource driven markets are intrinsically linked to commodity prices and resource demand while any improvement across the key lifestyle markets is dependent on uplift in buyer demand for holiday/retirement homes and improved prospects for a rental return and capital gain which may start to once again attract investors.